To satisfy the requirement of the Ionising Radiation Regulations (IRR17), it is important that there is cooperation and communication between employers when their representatives visit customer sites, such as during, service, maintenance, updates or applications training of Ionising Radiation Medical Equipment. Some years ago, following an approach from the Health & Safety Executive, the AXREM Service Managers Specialist Focus Group developed, a common Ionising Radiation Controlled Area and Equipment Handover Document. More recently, AXREM have been working with the Society for Radiological Protection (SRP) Medical Sector Committee and others, including partner societies, to produce a revised Radiation Controlled Area and Equipment Handover Form, with associated accompanying guidance. It is hoped this revised form will be adopted across all UK healthcare facilities for general use, to provide a consistent approach to the handover of controlled area and equipment. SRP and SCOR (The Society and College of Radiographers) will also make this document available to view and download on their websites. • An exchange of information between the Customer and the Company Representative. • Documentation and exchange of information regarding the work completed by the Company Representative (e.g. field service engineer). • Documentation of the Customers decision to return the equipment to use. Many hospitals have introduced their own version of a handover form but for consistency of understanding, AXREM believe it is important to have a single common form. In some cases, because of a multitude of different documents, our members Company Representatives (e.g. 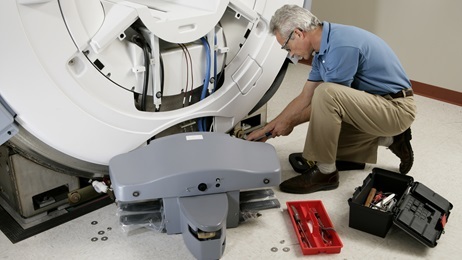 Field Service Engineers) have been reluctant to sign off in some circumstances; particularly where there are clauses outside the remit of Company Representative hand over, such as clauses relating to equipment being fit for return to clinical use. AXREM believe it is a best practice to have a consistent unified approach and their document can be freely downloaded here and is available for all to use. The current version of the handover document, together with its guidance notes, is the first to be produced in conjunction with SRP and is therefore referred to as Version 1. Version control of the document will be maintained by AXREM and only the official AXREM document is entitled to display the AXREM logo; no end user alterations of the document using the AXREM logo are permitted. The AXREM branding of the form will prove to be instantly recognisable to the Company representative of the participating organisations, and its use will provide for consistency and safety whilst minimising disruption to the workplace. It is not recommended to use an altered version of the form, for example with local branding.